Digital learning has come a long way since the “Oregon Trail” boom of the late 80s. Or has it? Despite mounting evidence proving the value of gamification, it is not uncommon to hear parents and teachers bemoaning students’ extensive screen time. In fact, according to a recent survey by Common Sense Media, most adults today perceive digital games as distractions. James Paul Gee, a landmark thinker on video games and learning, describes these misconceptions as the problem of content. 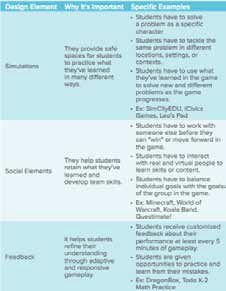 The problem of content refers to the commonly held belief that games are a waste of time because students don’t learn new academic content while playing them. However, Gee argues that learning requires the exact kind of “doing” that games provide. Well-designed games can be used to promote and hone learning. However, this doesn’t mean that every single iPad app or video game helps student achieve meaningful learning outcomes. In fact, a recent article by the Center for American Progress concludes that most iPad apps and other mobile games focus on the mere acquisition of skills and knowledge. Games that are worthy of kids’ screen time should require kids to transfer their learning to different contexts and situations. This ensures that they’ll develop competencies that they can use well beyond the simulated constructs of the game. Educators and school leaders have an enormous opportunity AND responsibility to enhance learning by selecting games that encourage students to tackle complex problems. So go ahead, play a little! Kristen Swanson is the author of Professional Learning in theDigital Age and founder of EdCamp.